Classic rock music lovers who think they don’t like poetry, and literary purists who think they don’t like popular music, may have been equally baffled to hear that Bob Dylan is a winner of the Nobel Prize in Literature. As an unrepentant English major, I’m delighted. I can’t remember a time when Dylan’s music wasn’t a part of my growing up, from the rebelliousness of the anti-Vietnam era to the bittersweet maturity of “Tangled Up in Blue“, my all-time favorite. When you think about it, any time you listen to a song — a current popular hit, a 1950’s oldie, or a centuries-old ballad like “Greensleeves” — you’re listening to poetry, only with a tune. In ancient times, before most could read or write, people turned stories into poetry and sang them because rhyme and melody made the stories easier to remember and retell. Much of rap music is poetry (often crude, but still poetry) with complex use of rhyme and assonance, and the musical element reduced to a backdrop of pounding rhythm. Poetry set to music can convey any and all human emotion. Love, of course. Jealousy — absolutely. Just pick a musical genre, and there’s a hit song about jealousy. In pop music, Taylor Swift’s “Blank Space” lets her revel in her psycho side. In country music, Carrie Underwood graphically explains in “Before He Cheats” what can happen when a woman wants revenge on her faithless lover, and takes it out on his car. And the still-creepy “Every Breath You Take“, the 1983 classic rock hit by The Police, blurs the fine line between devotion and obsession. Then there’s the universal human experience of grief. There was a time when every parent expected to lose a child, or more than one, because children often died from pestilence and poor sanitation. When my daughter Alexandra died unexpectedly at the age of five months, I couldn’t decide which was worse — thinking that I wouldn’t survive, or being horribly afraid that I would. It makes the father less to rue. Which cover lightly, gentle earth! Several years later, Eric Clapton’s four-year-old son Conor died in a terrible accident, leading Clapton to write the song “Tears in Heaven“. The deceptively simple lyrics pose profound theological questions. Every subsequent tragedy involving the deaths of children — from the 19 who died in the Oklahoma City bombing of the federal building’s daycare center, to the massacre of first-graders in Newtown, and the ongoing carnage in Aleppo — brings back to mind for me Jonson’s poem and Clapton’s music. Across the centuries, they unite parents who have become unwilling members of a club that no one wants to join. One day at the hospital, I went to the preoperative area to examine my next patient, a middle-aged woman who looked angry and unhappy before I even introduced myself. In anesthesiology, we often encounter patients who are anxious about their upcoming surgery, but this woman’s emotions were different. In the course of doing my preoperative evaluation, I couldn’t figure out what was the problem. Her overall health was good, and the planned surgery wasn’t a major operation. Finally, I said, “Please forgive me. But it seems as though something is terribly wrong. Is there anything I can do to help?” The patient’s eyes filled with tears, and she said that her son had died a month before. After a long moment, I said, “I lost a daughter too, years ago. The sorrow never goes away. But it does get easier to live with over time.” And with that, she relaxed, and the anger dissipated. The chain of connection continued, from Ben Jonson and Eric Clapton to me, and now to my patient. Poetry and music tell stories of universal experiences, and unite people who, at least superficially, have little in common. To me, the lyrics of Bob Dylan’s songs are just as truly poetry as are the sonnets of John Donne. Dylan’s scratchy voice has the remarkable ability to tell a story and evoke a mood in a few short lines. His lyrics contain a wealth of literary allusions, whether or not many listeners notice or care. If the Nobel committee’s award can illuminate the fact that poetry is everywhere, and isn’t inaccessible at all, then the committee members will have done a great service. Karen, this is beautifully stated. There are always songs, poetry to music, that stick in our minds forever it seems, tied to strong emotions. Thank you for sharing with all of us. As always, so beautifully written and captures the spirit of the award. I must admit that I was not in favor of giving a Nobel to Dylan, but you have at least given some good reasons. 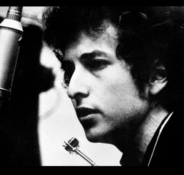 Dylan wrote love songs, angry songs, sad songs, uplifting songs, protest songs, long fable songs, and mystifying songs, . . . like no one before him. Beautiful. When we practice medicine and when we practice life with vulnerability we often find just what we’re missing — inevitable connection.